When jammed full of plugs and adapters your typical power bar is an eyesore you're happy to stash out of sight. 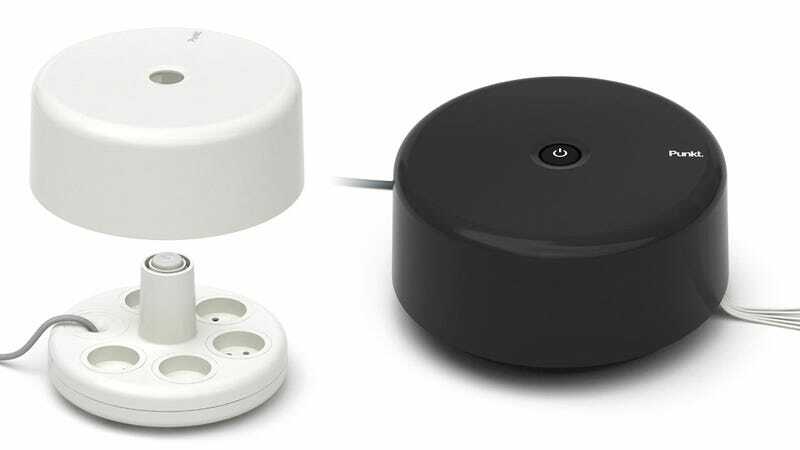 But Punkt's new ES 01 wrangles all your power cables in a beautiful UFO-like design that you just might want to put on display right next to the photos of your kids. Available in versions for varying outlet styles around the world, the ES 01 comes with a cover that not only keeps it looking neat and tidy, but also helps prevent the plugs from accidentally being knocked loose. Each unit expands a single outlet into five, although there's a good chance your beefier wall warts might not be able to squeeze under that cover. There's no pricing info just yet, but when the ES 01 is finally available you'll be able to snag one in red, white, or black to match or complement most office decors.